These services are outlined in detail below. Should you have any questions at any time please don't hesitate to give us a call or send us an email. No problem is too difficult, and at Clark Exploration we can create a custom solution tailored to your needs. Please call us today for a quote on pricing. Clark Exploration provides comprehensive monitoring and management of mining Claims, Leases and Patents (CLPs) in Ontario and the rest of Canada. Typically we ask that clients provide us with a complete list of their CLPs and preferably any option agreements (or Schedules from them) that have a complete list of tenure. We have noted that sometimes title is in names other than that of the company. 1. All CLPs are entered into a master tracking list with detailed information regarding the status, size, location, ownership and all other relevant CLP information. 2. All claims are then entered into a cloud-based calendar tracking system that will send email notifications to the appropriate individual(s) 4 weeks, 3 weeks, 2 weeks, 1 week and 1 day before the due date of the claim. 3. The master claim tracking list is updated on a monthly basis to ensure that all claim data is current. Any changes regarding the due date or status of the claim (extensions, work report submissions etc.) is also added to the calendar tracking system. 4. A monthly claim update is sent to clients providing a review of all of their claims. If there have not been any changes to any claims then only an email stating that is provided. 6. In addition to tracking the claims using a spreadsheet and cloud-based calendar system, cancelled claims are checked on a daily basis to ensure that no claim due dates are missed. If a claim does get missed, it is caught in time to be able to apply for a relief from forfeiture and subsequent extension. The client is notified immediately regarding any cancelled claims. We charge an hourly rate for initial input of the CLP data into the system (average property sizes take approximately 2-3 hours). The tracking service is then billed on an annual basis. Please call or email for a quote. Complementing our claim monitoring services are our abilities in claim management. Our claim management is a part of our larger mining act services. At Clark Exploration we have extensive working knowledge of the Ontario Mining Act and can help plan and implement a comprehensive solution which would include filing assessment work, assessment work distributions, extensions, etc. to best maintain your land tenure in good standing, help protect your shareholder interests and provide you with peace of mind. Clark Exploration also has experience providing similar services in other jurisdictions so don't hesitate to call or ask for further information. 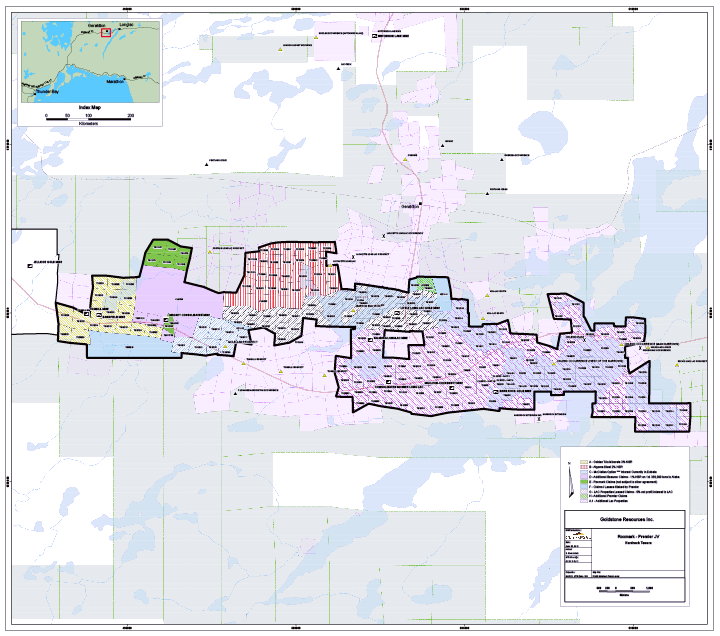 In addition to our monitoring and management services our clients usually request a due date (colour-coded) compilation map of their land holdings. Other pertinent data of the CLPs details can also be illustrated. This can either be provided as a PDF file for periodic review, paper plotted or published in ArcGIS Online for your review and manipulation. Three examples of these types of maps are shown at the bottom of this page and larger detailed versions can be provided upon request. These maps are produced at an hourly rate. The largest map took approximately 8 to 10 hours to complete (8-10 projects), a smaller map with 3-4 projects took approximately 2 to 3 hours to complete and, finally, the a detailed underlying ownership map required a review of option agreements took approximately 8 to 10 hours to create. 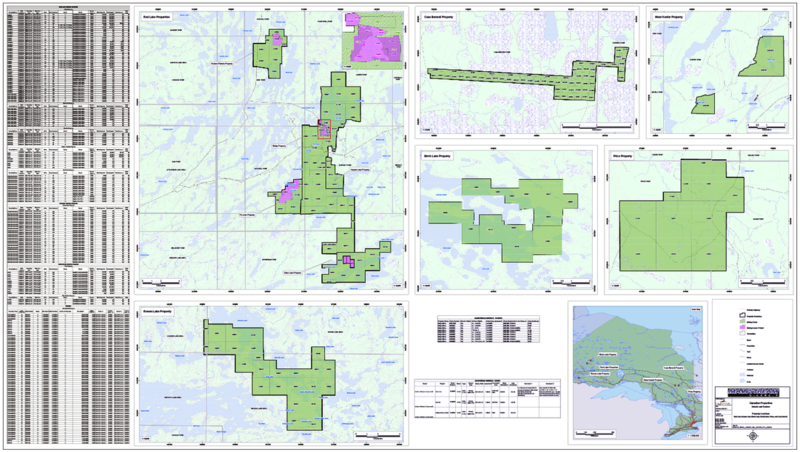 The maps mentioned above are for land tenure management and review purposes. Should you require maps for PowerPoint presentations, websites, promotional material , etc. we also provide that service on an hourly basis. Using Adobe Illustrator and Adobe Photoshop these maps are of better aesthetic quality geared towards marketing. Maps can be created to your preference in any format and in any dimension you need for any desired application. Sample images can also be provided upon request. At Clark Exploration our primary software products are Adobe Illustrator, Adobe Photoshop, ArcGIS 10.2, and Target for ArcGIS. We also have experience working with other software programs such as MapInfo, Leapfrog, Geosoft Oasis Montaj, iOgas, Geochemistry for ArcGIS, Google Earth and AutoCAD so we can work with just about any data format you prefer. For clients that prefer working in Google Earth, we can easily convert land tenure into KML format for easy viewing when doing any Land Tenure Mapping, or provide format conversion at an hourly rate. Approximately 8-10 hours to complete. Approximately 3-4 hours to complete.